Review Summary: A brilliant family drama taking the genre into new directions. Superlative performances from the cast, this one is a winner all the way! Kapoor And Sons is a winner all the way. On an overall basis, ‘Kapoor & Sons’ is a decent, neat and a clean family drama which will be loved and connects with everyone who like such types of films. The slow narration and repetitive tracks might dilute the fun for few, while others, will cherish this film where the legacy of family drama continues. The film, to a great extent, belongs to Fawad Khan - and he is terrific. Rishi Kapoor as grandpa serves as a perfect foil to the tension, and one must give it to him for the laboured make-up he had to wear. This film takes an alternate KJo route, to say that it's all about accepting and forgiving your family. Sure, you didn't get to pick one, but now that you're stuck with one, accept it. Like a mole on your forehead, it's distracting, embarrassing and obnoxious, but it's all yours. Kapoor & Sons' is a family entertainer which is high on drama! 'Kapoor and Sons' doesn't have matured casting and the young and dynamic casting has some imperfections and that is what has made the movie so special. They don't provide matured performances however even during crucial scenes. Alia Bhatt has definitely recovered from the colossal flop of 'Shaandaar'. The movie has its emotions and it may bring tears in few scenes. Fawad Khan, Sidharth Malhotra and Alia Bhatt’s story is predictable yet beautiful as a narrative! Sidharth Malhotra, Fawad Khan and Alia Bhatt's 'Kapoor & Sons' is a complete heart-stealer! Watch Kapoor & Sons for Alia Bhatt‘s naughty, funny moments, for Rishi Kapoor‘s hilariously perfect acting, for Sidharth Malhotra and Fawad Khan‘s brilliant performances. But more importantly, watch it to see a drama that is packed with emotions and tiny heart-melting moments that are sure to leave you with a smile and a hazy view. Make sure you go with your family at least once. There’s a strong Karan Johar impression on Kapoor & Sons, but that is expected. After all, he is the producer of the film. Fawad Khan SHINES, while Sidharth Malhotra and Alia Bhatt’s TERRIFIC performances make this film worth a watch! Touted as a romantic comedy, Kapoor & Sons is far more than just being that. It is neither a love triangle, nor a family drama. The movie has elements of love, compassion, emotion and rage. Do not give this one a miss. I would unhesitatingly recommend the film to anyone who likes a few mushy moments and are willing to give good commercial cinema its rightful space. ‘Kapoor & Sons’ Sets A Very High Benchmark For Family Dramas In Bollywood! This might be the new-age family drama, but the message is still the one Bollywood has drilled into us all these years – it’s all about loving your family. The film doesn't have a protagonist or an antagonist but embraces the differences between characters whole-heartedly giving a fabulous experience as a whole. Because it's about loving your family - sharp edges and all. Held together by Sidharth Malhotra, Fawad Khan and Ratna Pathak Shah's theatrics! It is a movie that has everything to celebrate and get entertained. The performances by the lead actors take the film to the next level. The film will make you cry, laugh and smile via this one. ProducerDirector Karan Johar is known for making entertaining films catering to all sorts of audiences right from the rural parts of India to the NRI's in the foreign lands. His films are known for larger than life portrayal of our society and that's what manage to work in the favour of their films. While most of their films belong to romantic genre, there were few catering to the family drama type of audience. The variation of this genre can be seen in terms of films like 'Kabhi Khushi Kabhi Gham' and 'We Are Family', where one manages to touch the right family nerve of its targeted audience, while others ended up being totally opposite. Their latest offering in this genre is 'Kapoor & Sons', which also reminds us of Hollywood film 'Sabrina'. 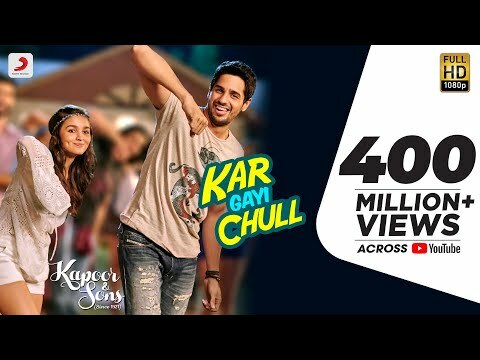 The expectation level are high due to association of young heart throbs like Alia Bhatt, Fawad Khan and Sidharth Malhotra along with highly popular song 'Chull'. It tickles your funny bones and touches deep corners of your heart. It leaves you in splits and moves you to tears. 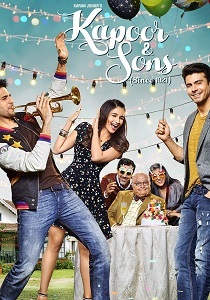 Kapoor & Sons Review: Shakun Batra's Kapoor & Sons is a refreshingly lively take on a dysfunctional family that constantly teeters on the edge of disintegration and yet manages to stick together. Strong performances and charming characters compensate for a lack of depth and acuity in Shakun Batra’s movie. Fawad Khan steals the show in this tale of loving your dysfunctional family! KAPOOR & SONS is supple and smooth, with lots of rough edges and highs and lows. It's a perfect family movie. Music is peppy and the back ground score is apt for the scenes in the film. Cinematography is very good and the editing has negligible flaws. Director Shakun Batra has managed to come up with the quality output this time, unlike “Ekk Main Aur Ekk Tu” in the past. Karan Johar’s hand in the film is surely felt. There is fun moments, emotional atyachaar and yes, love quotient in the Sidharth Malhotra, Alia Bhatt and Fawad Khan starrer. The movie has rich production values and melodious music and beautiful picturisation are the highlights on the technical front. In short Kapoor And Sons is a winner all the way.